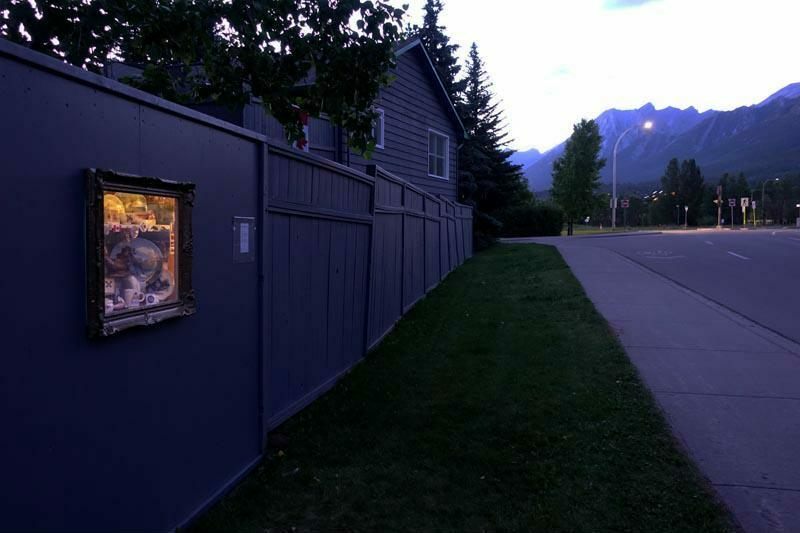 curbside museum is an unassuming curiosity in the mountain town of canmore, canada. the tiny museum is always packed with intricate little exhibits that rotate every so often. 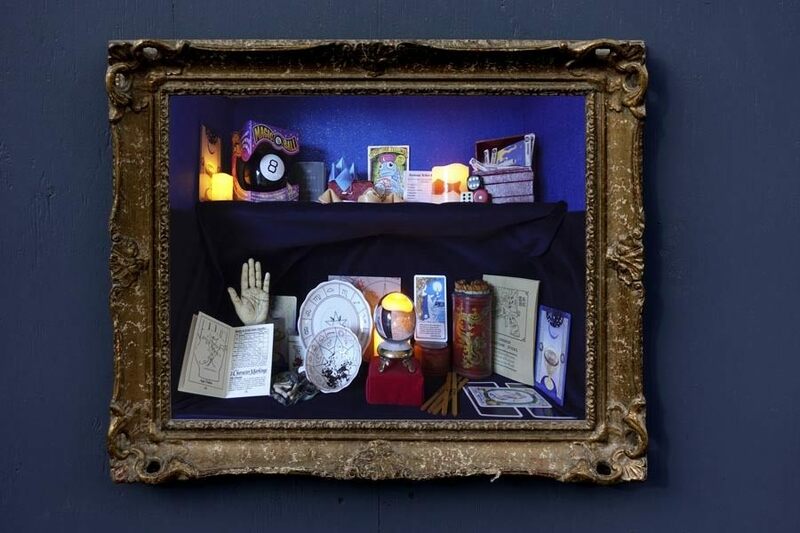 each exhibit is incredibly detailed, their contents all stuffing the glass showcase to the brim with a delightfully unexpected assortment of items. this tiny museum is hidden within a hole in a fence that lines a busy street. the gilded frame is the only hint that this particular stretch of fence holds more than first meets the eye. you could easily walk right past it if you weren’t paying attention. you’ll find subjects ranging from common scenes to those that transcend into the realm of fantasy. some of the showcases take on a more serious, factual tone, though many exhibits do indeed have an element of whimsy and charm. the museum is a fun addition to the town and adds a moment of joy for any pedestrians who stop and take a peek. 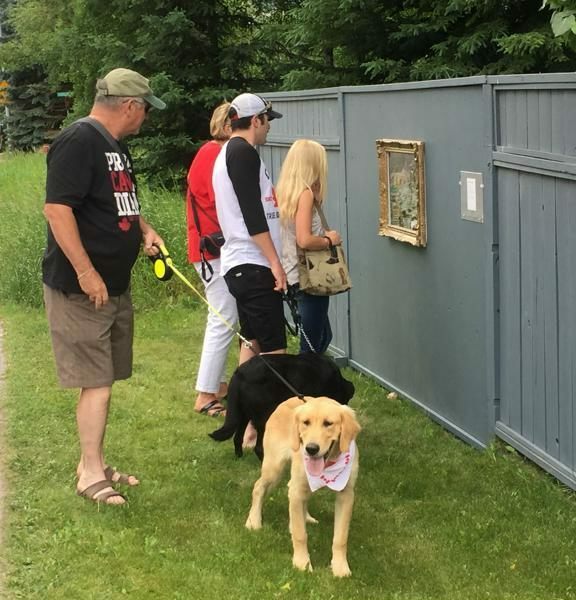 it’s a reward for eagled-eyed passersby who take the time to notice their surroundings. the museum is free and is open day and night. Very cool. I’ve never been to Alberta, but I’ll look for it if I ever do. I love stuff like this! Such a great idea. Love the photos. I’m glad to see even the dog is rewarded, Beth. What a wonderful idea to give to the community! What a lovely gift of originality and fun — I have never heard of anything like this and am smiling as I think about it. Thanks Beth. it’s hard not to, isn’t it jet ? my pleasure – isn’t it nice? Great find, Beth! I love Canmore. I will have to find this the next time my better half and I are up there. How truly wonderful. We should DEFINITELY have more of those fantastic little surprises everywhere. So much fun. isn’t it an interesting project ? I love it. This is very cool! I was through Canmore many years ago but did not see this. Very special! People are brilliant in their ways to share with and intrigue others. so…….I just created one of these smack dab in the middle of my cluttered living room? I think? there you go. now invite in the humans and animals for a peek. I am hoping the animals do not CHRISTMAS TREE it and it all ends up on the floor…and humans generally think I am nuts…so it is just for me to look at…ain’t that weird? well, allrighty then….back to my interior design artistry! ha! That’s super cool. Someone is going to the trouble to make life a little bit better for lots of people.